brought to you by the Pine Needle and the West Side Modern Club! 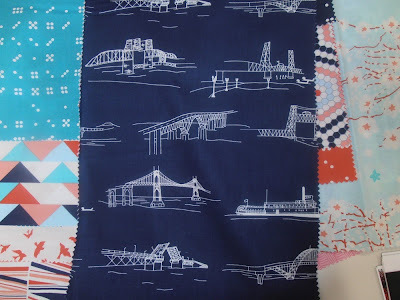 PMQG is joining the West Side Modern Quilt Club in creating quilts inspired by the bridges of Portland, Oregon to be shown at the Northwest Quilting Expo May in 2014. Use a minimum of 1/2 yard of the lovely new Waterfront Park collection by Violet Craft for Michael Miller (and PMQG member!) *PMQG members get 15% off this collection at the Pine Needle through the end of July. Rumor has it that the due date has been changed to June 1. Is this true? Several of us are confused, and can't seem to verify this anywhere. Yes the date was changed and is reflected above. I hope you got the reply I sent to you when you posted your comment!